This photo is from the title shoot of ‘Good Morning with Anne Nick’ in 1992. 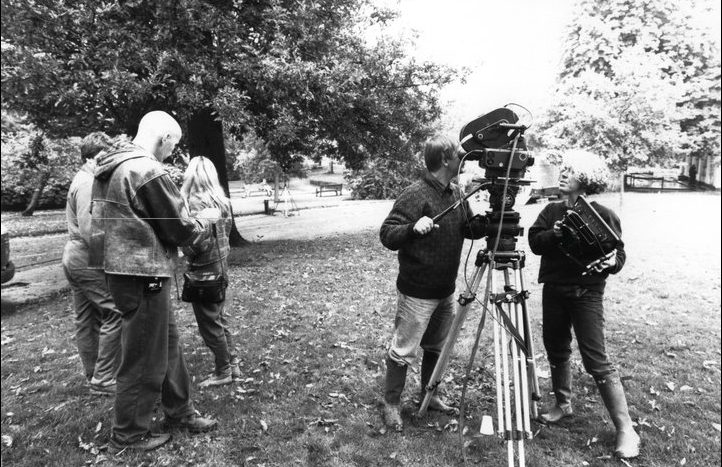 Clive Wagner (on the left with the bald head) was the director on the shoot. He was a director on ‘The Clothes Show’, and very well thought of. The cameraman is almost certainly Tim Johnson, and the assistant, Sue Cane. The titles were shot on 35mm film, which was a real luxury. ‘Good Morning with Anne and Nick’ began on 12 Oct 1992, and was on air until 1996. Their first guest on the sofa was Joan Collins. The popular morning magazine show was presented by Anne Diamond and Nick Owen. Anne’s husband, Mike Hollingsworth, was the series editor. ‘Good Morning’ was set in Studio C, the Pebble Mill foyer, where ‘Pebble Mill at One’ was set, but the instantly recognisable windows and view out on to Pebble Mill road were blocked out by the living room type set.